Atlanta, Georgia is a huge destination for Southeast travel. This thriving metropolitan city not only houses Georgia’s state capitol complex, but also holds a plethora of fun activities. Atlanta is a foodie’s paradise and shoppers will be awed by the many upscale shopping centers. Whether exploring the Georgia Aquarium or joining people from all over in the World of Coca-Cola experience, you can count on a good time in the city of Atlanta. Here are three fun things to do in Atlanta, Georgia that everyone should enjoy. Downtown Atlanta is laid out so that many major tourist attractions can be visited within steps of one another. This area is known as Pemberton Place, named after Coca-Cola’s founder. Atlanta’s most popular attraction, the Georgia Aquarium, welcomes thousands of visitors each day who long to explore underwater life. It contains over 10 millions of gallons of fresh and marine water that is full of incredible specimens of sea life and ocean creatures. Families will love everything about this big draw. The star of the Georgia Aquarium is the Dolphin Celebration show, which takes place several times a day. It draws huge crowds so arrive early to ensure you have seats. Bottlenose dolphins and their trainers put on a beautiful show full of jumps, ultimate swim moves, and lots of love and kisses which will warm the hearts of the audience. This show is a visual treat. The Dolphin Celebration show will leave some drenched (first 10 rows are soak zones) and others just amazed. Do not miss the Waddle Walk, where adorable African penguins are on display. Watch as they make their way down the ramp for everyone to ooh and aah over. Have your cameras ready because it is over before you know it, but the penguins are priceless! Other points of interest in the aquarium include the 4-D Funbelievable Theater, Under the Boardwalk (cute as can be Califonia sea lions), and Cold Water Quest. 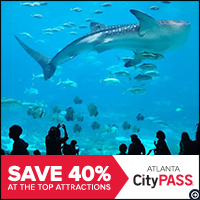 Pro Tip: Save money by buying your ticket online, arriving after 4PM, or purchasing the Atlanta CityPASS, which saves you 40% off the admissions of the aquarium and 4 more popular attractions. Save 40% on Atlanta’s 5 best attractions with CityPASS. Shop Now! A visit to the Hard Rock Cafe always ensures a good time, great music, and menu items we all know and love. HRC’s burgers are so great that they are known throughout the world! Where else can you dine while feasting your eyes on a restaurant full of music memorabilia? Hard Rock has TVs showing live concerts or music videos to enjoy during your dining experience. It is as much a memory as a meal. Flatbreads (creative combinations), Wings (meaty and zesty), and Nachos (piled to the moon with ingredients) are great starter dishes to share. Hard Rock’s Barbecue Combo, Pulled Chicken, and Pulled Pork meals have become incredibly popular recently. They are served with Cowboy beans, cole slaw, and seasoned fries, which pair nicely with a side of Blue Cheese dressing. Finicky eaters may prefer the Classic Club (chicken) Sandwich or the Half Pound Angus Burgers on a toasted Brioche bun. Kiddies under 10-years-old have their own special menu to choose from with dishes such as Mac-Daddy Mac and Cheese, Ain’t Nothin but a Hot Dog, and Sir Kensington’s Classic Cheese Pizza. The Atlanta based Hard Rock Cafe is located in a centralized downtown location and specialize in creative cocktails and over-the-top desserts, as well as consistently delicious food. HRC’s collection of historic rock exhibits are from musicians that originated or became famous under the Mason-Dixon line. Make sure to visit their legendary gift shop where you can pick up cool t-shirts, accessories, and a few surprises. Hard Rock’s collector pins are a fun souvenir and make for a cool collection. Whether you are a Coca-Cola, Diet Coke, Sprite, Fanta Orange, or Dasani drinker (over 500 in total), all worlds unite in this fascinating museum inspired by our lifelong love of Coca-Cola beverages. The iconic soda was founded in Atlanta by Pharmacist John B. Pemberton in 1886. Since 2007, the World of Coca-Cola has attracted visitors from around the world. A beverage of choice is provided upon entry to enjoy while watching an introductory film. Surrounding you, a mini-museum of Coke artifacts are on display to allow for a stroll down memory lane. Activities include watching Coke international commercials, experienceing the Vault of the Secret Formula, and perusing art from the Pop Culture Gallery. Bottle Works and Miles of Refreshment are both educational and fun exhibits as well. A fan favorite is to meet and greet the Coca-Cola polar bear, of 1993 “Always Coca-Cola” commercial and TV fame. Pictures with the polar bear can be purchased in the gift shop or you may use your own camera. A trip to the World of Coca-Cola would not be complete without tasting Coca-Cola products from around the world in the Taste It! portion of the museum. Come sample over 100 international and domestic brands for yourself, all displayed geographically by the country’s origin. Sampling Bar is where you may try limited edition items. Trivia: Today, 1.9 billion Coca-Cola beverages are drank each day. Pro Tip: Baby Boomers and Gen X’ers will want to visit the Coca-Cola Theater. Here, they can glimpse an oldie but a goodie, “I’d Like to Buy the World a Coke” commercial performed in 1971 by the Hilltop Singers. Have you Visited Atlanta, Georgia Lately? Atlanta, Georgia has the 5th largest metro population in the United States. It is a tourists and families favorite destination due to its climate, variety of attractions, and diversity. Atlanta is also a top-notch business hub with stellar transportation options. While the things to see and do in Atlanta are nearly endless, we hope you will enjoy these fun things to do in Atlanta selections. Thank you to CityPASS, a great way to save money when visiting tourist attractions, for the Atlanta attraction admissions. I’ve never been to Atlanta but those look like fun things to do. Nice photos! Thanks for sharing your tips. I enjoy my life with fun places such as new York and most adorable place where i enjoy a lot that is Atlanta. Can never go wrong at a Hard Rock cafe … and the coca – cola museum look s amazing! Atlanta can be so fun! The World of Coca Cola is a blast. Got to go there in 2012! It’s been years but I went to the world of Coca-Cola and loved it. Me, too! I don’t know how I missed it all these years. I love using CityPASS to save on tickets! The penguins are the cutest – I would definitely not want to miss the Waddle Walk if I visit the aquarium! This is so prefect! One of my best friends and I were just talking about possibly taking a trip up to Atlanta! I think it’d be really cool to go to the Coca Cola Factory. Atlanta seems like an excellent destination! These things are just so fun! I’ll be flying to ATL for the first time this Christmas so I will definitely be sure to stop by the Coca Cola museum. However, I disagree with your choice of recommending the aquarium. Georgia Aquarium is ranked has one of the worst tanks for dolphins and whales in North America (not to mention that these dolphins/whales are taken from the wild). Cetacean exploitation is not a “beautiful show full of jumps [and] ultimate swim moves” and is far from what you call a “visual treat” – esp when so many have died in their hands. Please consider removing Georgia Aquarium from your blog.